The soothing fragrance of this Patchouli Incense Stick will surely remind you the traditional Indian custom of devoting flowers to the God. 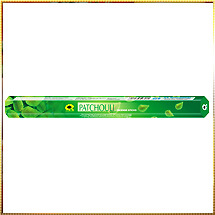 Fragrance of this range of Patchouli Incense Sticks are deeply admired by one and all. Our Patchouli fragrance incense sticks with its refined fragrance has made a distinguished position in the market. Apart from Indian rituals, it is widely used in therapeutic centers, spas, and many other aromatherapy institutions. The innovative combination of aromatic flowers and other combustible materials have created a fragrance that is mild yet very soothing. This fragrance creates a relaxed environment that refreshes the senses and arouses the meditative mind. Our Patchouli scented incense sticks are available at affordable prices and in attractive packings.